Pres. 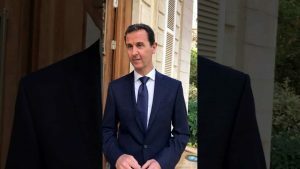 Assad: In the crosshairs of the US Neocons and NATO for many years. His refusal to do Washington’s bidding attracted the wrath of the empire. The main tormentor and butcher of his people is the retiring war criminal Barack Obama and his Neocon crew of global hegemonists. As much of Washington prepared for the inauguration of President Donald Trump, I spent last week on a fact-finding mission in Syria and Lebanon to see and hear directly from the Syrian people. Their lives have been consumed by a horrific war that has killed hundreds of thousands of Syrians and forced millions to flee their homeland in search of peace. It is clear now more than ever: this regime change war does not serve America’s interest, and it certainly isn’t in the interest of the Syrian people. We met these children at a shelter in Aleppo, whose families fled the eastern part of the city. The only thing these kids want, the only thing everyone I came across wants, is peace. Many of these children have only known war. Their families want nothing more than to go home, and get back to the way things were before the war to overthrow the government started. This is all they want. A TRULY DANTESQUE VISION, A RIVER OF PEOPLE FLEEING THEIR HOMES AND A BRUTAL ENEMY. BUT WHO CREATED THIS HELL? 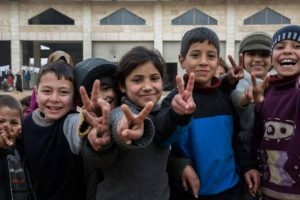 The Obama-supported CIA-engineered Syrian war has produced a tsunami of refugees, not to mention destroyed much of Syria and caused the death of hundreds of thousands of innocent people. By what standard is that not a self-evident, heinous international war crime? What moral right does the US have to commit these atrocities except the big lies it has deployed with the damnable complicity of the Western media? I met these amazing women from Barzi, many of whom have husbands or family members who are fighting with al-Nusra/al-Qaeda, or with the Syrian army. When they come to this community center, all of that is left behind, as they spend time with new friends, learning different skills like sewing, making plans for their future. They were strangers before coming to this community center whose mission is empowering these women, and now they are “ sisters” sharing laughter and tears together. Below:Videos with Tulsi presenting her case against US/NATO meddling in Syria. Note (in the case of CNN) the repeated efforts by the anchor to pollute Tulsi’s truth narrative with reference to the US State Dept. talking points and accusations of moral imbeciles like Adam Kinzinger, happily trotted out by war propaganda shills like CNN, CBS, the Washington Post, the New York Times and the rest of the complicit mainstream media. 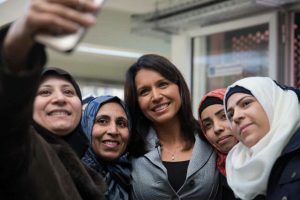 Tulsi Gabbard is an American politician and member of the Democratic Party who has been the United States Representative for Hawaii’s 2nd congressional district since 2013. She was also a vice-chair of the Democratic National Committee until February 28, 2016, when she resigned in order to endorse Senator Bernie Sanders for the 2016 Democratic presidential nomination. 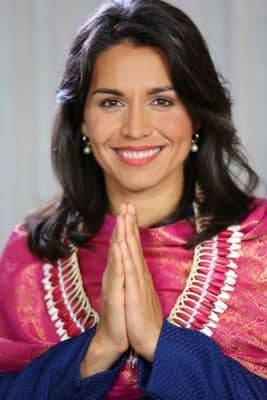 Elected in 2012, she is the first American Samoan and the first Hindu member of the United States Congress. She served in a combat zone in Iraq.